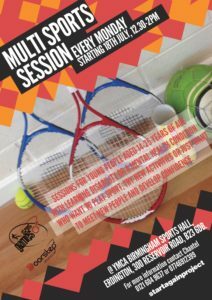 Erdington based Community Interest Company, Start Again Project are pleased to announce a new sports programme to take place at the brand new sports hall at the YMCA in Erdington. The organisation has received funding from the national sports charity Street Games, to set up a new Door Step Club programme for young people aged 14 to 25 who suffer with their physical and mental health and face barriers to participating in regular sport. The programme will take place every Monday at the recently opened YMCA community facility between 12:30pm and 2pm. The session will involve a variety of sports and activities including accessing the Street Games network of festivals and events across other towns and cities. Importantly the session will also take advantage of the excellent facilities at the venue which provides an opportunity to socialise and meet like-minded young people. Erdington based Start Again Project has been in existence for 8 years delivering outreach sport and well-being programmes and providing semi supported accommodation to some of the city’s most vulnerable young people. Established in 2005, Street Games helps to make sport more widely available for young people living in disadvantaged communities throughout the UK. The benefits of this ‘doorstep sports’ approach include providing a wide range of sports and activities in the right style, at the right time.